Once you have settled into the club you will soon want to test your photography skills. This is where Club and Inter-club competitions can really help. To enter a competition you will need to mount your print onto a board. There are numerous ways to mount prints, this outline is a way to get started. The mount should be large enough to balance and support the picture, and the texture and colour should compliment the overall tone of the photo. As of today the Standard excepted colour for print mounts in competition is plain white. On A1 paper an image printed at 25cmx35cm looks fine in a 40x50cm mount so there is no need to print edge to edge if you have an A3 printer. Mount board is usually supplied at A1 size (60cmx90cm approx) and mounts cut from it as required. 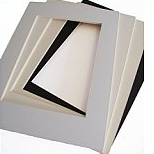 Only two 40x50cm mounts can be cut from a single A1 sheet but you can obtain four small mounts. The simplest way to display a photo is to cut a mount to the required size and then glue a print to its surface. Position the print on the mount and lightly mark the position of the corners with a pencil. Then place the print face down on a larger protective item such as a piece of cardboard (newspaper works as well) and lightly spray adhesive on the back as per the instructions on the spray can. After 15-20 seconds carefully position the print to match the corner marks on the mount and gently smooth over the surface with a clean cloth to press it down and remove air bubbles. Over a period of time the mount may warp a little from having a photo glued to one side but it is a quick and most often used way to start mounting photos. The next 'step up' from the previous way is to glue the print on to a separate backing card, bevel cut-out a suitable size opening in the mount and then secure the print/backing card in position on the rear of the mount using masking tape. This produces a more professional looking presentation. Gluing the print to the backing card is a similar process to gluing to the mount described above, however, cutting out a beveled opening does require special tools and careful measurement to accurately match the opening to the print size. To save work you can get mounts cut to order. This saves having to deal with large sheets and you can also include cutting out a beveled opening but this limits creative image cropping as the displayed print would need to be a standard size to fit the cut-out. You can also buy ready cut mounts in various sizes from local shops. Don't forget there is always someone within the club that will be willing to give you help and guidance.....you need only ask.